The discovery of the Bernissart Iguanodons, of Hadrosaurus and of Compsognathus was reinforcing the view that dinosaurs were indeed bipedal. However, by 1877 North American explorers were finding evidence of huge quadrupedal dinosaurs, far larger than anything previously known. They were labelled as sauropods. 1. 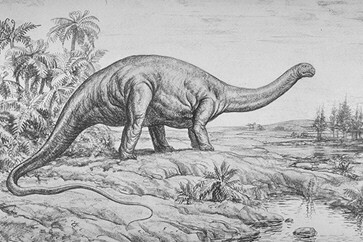 The Brontosaurus was actually the same creature as the Apatosaurus that he had named 2 years earlier. Nowadays it is referred to as an Apatosaurus. 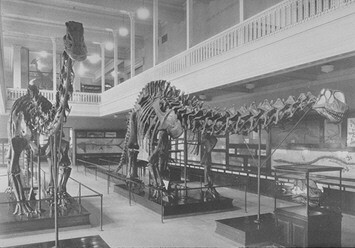 The famous Carnegie mount of Apatosaurus louisae, mounted in 1913 with a Camarasaurus cast for a head. 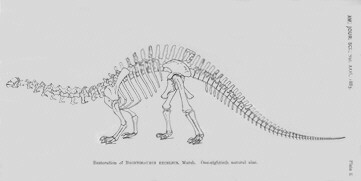 The original specimen, found in 1909 by Earl Douglas, had no head, but a Camarasaurus-like skull was found nearby.